PowerInbox, the email platform company which merged with competitor ActivePath a year ago, is today launching technology called SecretInk that enables “self-destructing” messages that can be sent over email or SMS. The system works online or inside Gmail and other webmail services using the company’s PowerInbox add-on. This utility also enables other interactive email content from dozens of social networks, news sites, and more. 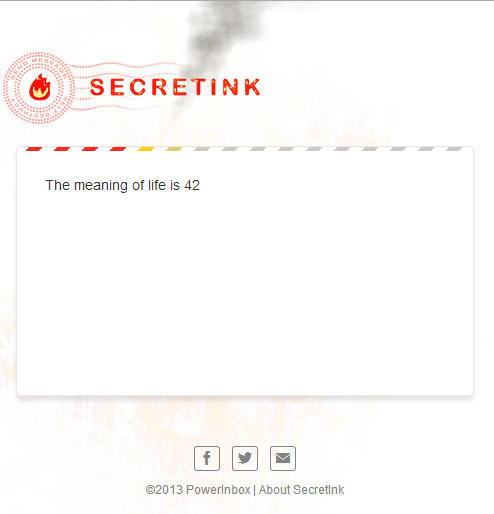 But SecretInk is one of the first email applications the company has funded itself. The move to launch an email add-on that enables additional privacy comes at a time when other encrypted email services like Silent Circle and Lavabit have preemptively shuttered their services in the wake of the NSA’s spying agenda, deciding it would be better to not exist at all than to risk their users’ privacy. The email application enables messages to be sent fully encrypted over the network using HTTPS. “No plain text or message content ever goes through third-party servers,” Thazhmon explains. “We also remove the message from our servers as soon as it’s opened. No copy is retained or backed up in any way. Messages are never retrievable after they’ve been opened,” he adds. 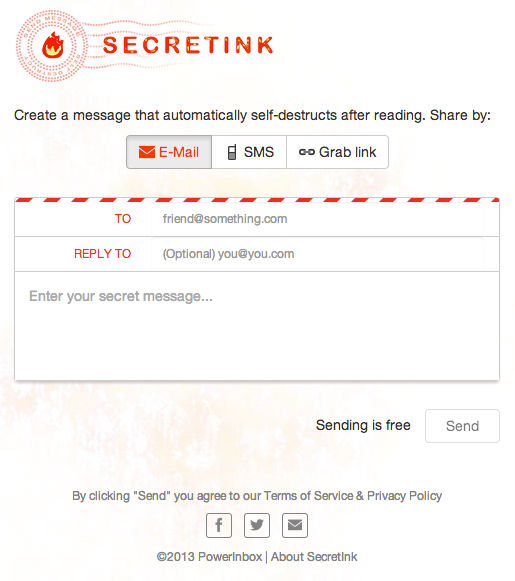 When a sender creates a message using SecretInk on the web, no login is required, and the recipient is then alerted via either email or SMS that they have a message waiting. In other words, the actual communication doesn’t contain the actual message content. In addition to Gmail, SecretInk’s system works with Hotmail, Yahoo, and any other clients PowerInbox supports, including, soon, some mobile clients too. And it also works over SMS, which is something that makes it different from other encrypted email providers. The SMS aspect may have some appeal, as users today turn to a variety of mobile messaging apps to communicate more privately. In those cases, it’s often less about fears of government spying, but rather representative of a tide change in what users want from their social services – that is, something smaller and more intimate than Facebook. Apps for self-destructing texts are hugely popular right now. Snapchat thinks it’s worth more than $3 billion. Other competitors are also trying to get in on the action with private messaging apps like Privatext, Wickr, Frankly, Gryphn, and many more, which themselves followed TigerText and others‘ first steps in this space many years ago. With SecretInk, though, you have an app that straddles the line between a web and mobile offering, which is something of a twist. While it works over SMS, it works right from your inbox, too. Thazhmon, of course, likens the new service to Snapchat, noting that it shares one of that service’s faults, too – a user could take a screenshot of the message to keep a copy for themselves. In other words, the system is more about keeping sensitive information out of the hands of the government, or anyone else who could be spying on your inbox (including, perhaps hackers or snooping spouses) – but you’ll still need to have some trust for the person on the other end of your missives. As a side note, the SecretInk app was built by former members of the TweetDeck team, says Thazhmon. This group is now working to add more features including animations, plus support for pictures and attachments, as well as dedicated mobile apps. Correction: Thazhmon’s title is CPO post-merger. He was previously CEO of PowerInbox. The article has been updated to reflect.